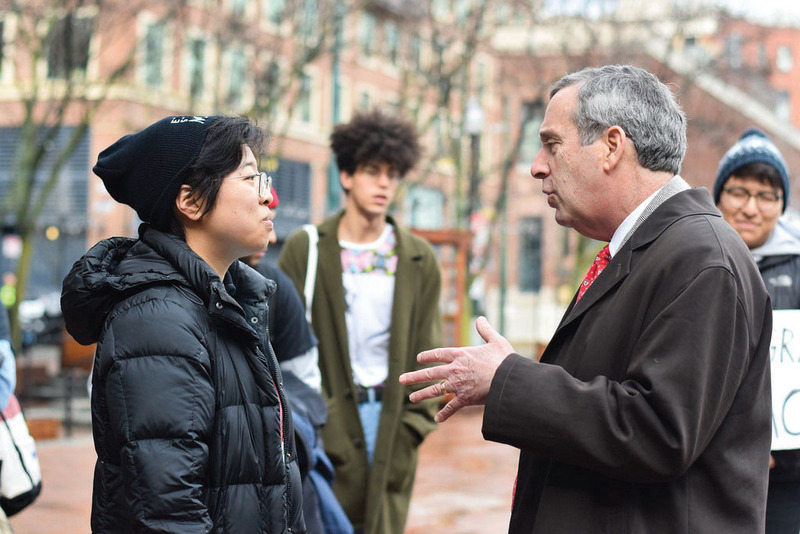 University President Lawrence S. Bacow speaks to Sally Chen '19 at a demonstration Friday where students and alumni called on Harvard to create an Ethnic Studies program. 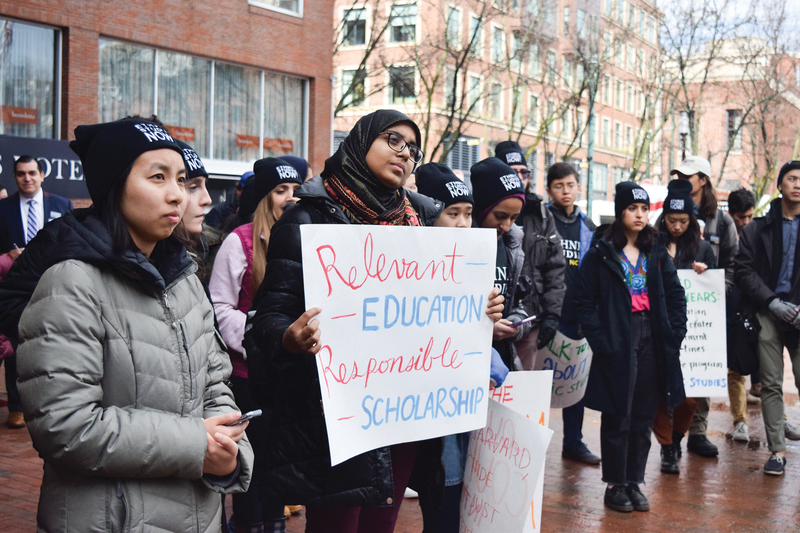 More than 50 Harvard students gathered outside the Charles Hotel Friday afternoon to demand the University create a formalized ethnic studies program. The Harvard Ethnic Studies Coalition, which comprises affiliates across the University, organized the event, dubbed “The 47-Year Fight: Student Rally for Ethnic Studies.” Students specifically chose to congregate at noon to attract the attention of alumni and administrators — including University President Lawrence S. Bacow — attending the Alumni Leadership Conference luncheon which took place in the Charles Hotel at the same time. Jeannie Park ’83, a Coalition member and president of the Harvard Asian American Alumni Alliance, said she hoped that holding the event at the same time as the alumni conference would encourage alumni to help publicize the need for a formalized ethnic studies program. Prior to his speech at the conference and the start of the rally, Bacow paused outside the Charles Hotel to converse with students. James L. Walkingstick ’21 opened the rally with a prayer in his traditional language of Cherokee to bless the cause. Several students read passages from University and Crimson archives, including letters penned by activists dating back to 1985. They also read past Crimson articles about historical developments in the fight for a formalized ethnic studies program. College students staged a rally at the Charles Hotel Friday arguing for the establishment of an Ethnic Studies program at Harvard. Speakers also shared personal stories about grappling with their ethnic identities and the mentorship they have received from Harvard faculty members who teach ethnic studies courses. Sally Chen ’19 spoke about her thesis advisor, Assistant History Professor Genevieve A. Clutario, praising Clutario’s course HIST 1013: “Introduction to Asian American History” specifically. “Asian-American Studies was like taking a breath for the first time,” Chen said. Clutario, who researches Asian-American history from a transnational perspective, recently accepted a position at Wellesley College. 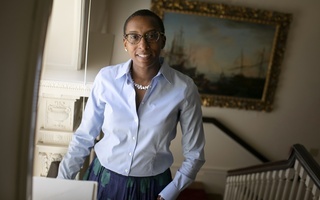 Her impending departure, along with the University’s decision not to put Associate Professor of Education Natasha K. Warikoo up for tenure, attracted sharp criticism last week. The Harvard Ethnic Studies Coalition, the Harvard Asian American Alumni Alliance, and the Coalition For A Diverse Harvard each penned letters to Bacow denouncing the imminent loss of Clutario and Warikoo, who constituted two of three Harvard professors who study Asian-American studies. Rally participants pointed out that many of Harvard’s peer universities — including Stanford University and Yale University — have already established their own ethnic studies programs. 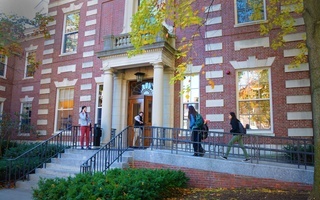 Harvard currently offers an Ethnicity, Migration, Rights secondary and an Ethnic Studies field of study within the History and Literature concentration. 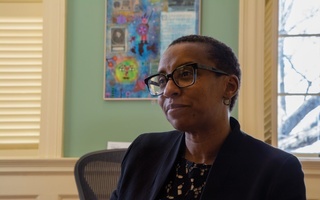 Faculty of Arts and Sciences Dean Claudine Gay said in an October interview that FAS is conducting searches for faculty specializing in ethnic studies and that she plans to meet with advocates this semester. Chen said at the rally that Harvard must demonstrate its commitment to diverse curricula now, especially as the University faces a lawsuit alleging discrimination against Asian-American applicants to the College. Several rally attendees said the push for a formalized ethnic studies program had deep personal importance to them. “Having ethnic studies symbolizes that our histories are important. They are valid, and they are worth learning,” Tajrean Rahman ’20 said in an interview. As students chanted “Out of the Courtroom! Into the Class!” outside of the hotel, several alumni joined the group to show their support or just to listen.